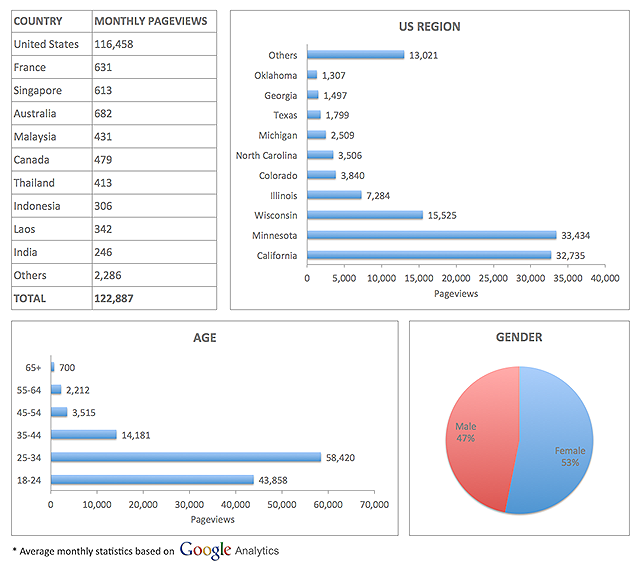 Over 100,000 views per month. 56 total ad slots for 5,600,000 ad impressions per month. Local, national, and international exposure. Direct link to business websites or ads designed by The Hmong Journal. Ad placements next to current and popular articles on a daily basis. Customers' accessibility to latest ad promotions anywhere and anytime with internet access. Affiliation with one of the most Facebook LIKED Hmong website. 10% of all 2015 ad businesses will go towards helping the Hmong communities globally. LOW RATES with HIGH VIEW COUNTS compared to other unaccounted advertising forms. Still skeptical about online digital advertising? 1.) Print vs. Digital: Where Should You Spend Your Ad Dollars? (1) Select an AD LOCATION. (2) Select a term. (3) Pay for term. (4) Email artwork and link with order number to sales@hmongjournal.com. Have questions and comments about advertising? Contact sales@hmongjournal.com. *Actual ad placements may vary slightly. Ad placements on the following pages: Hmong US News, Hmong World News, Asian News, Asiam Media, and Article Pages. Note: All ad periods begin on the 1st and 15th of every month. Ad purchases must be paid for and artworks / links submitted 3 days before the start of the period, otherwise the next start period will be considered. All purchases are non-refundable. Please review the online advertising agreement details before making any purchases.